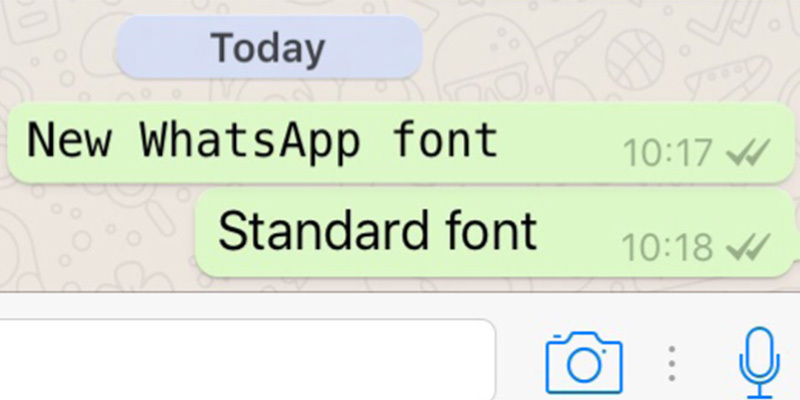 Developers are constantly working hard to improve WhatsApp and although it may not be headline news, the new font FixedSys has now been rolled out to both Android and iOS users. It may not seem like a big deal but it’s an improvement which can make messaging a little more exciting. The new FixedSys font is activated by using a specific combination of characters, just as italics, bold and strikethrough are. In order to use the new font, your message should be written with three backticks either side of the message. By doing so, you will notice and will be able to compare the difference to other messages which are written using the standard WhatsApp font. This isn’t a particularly efficient or user-friendly way of using fonts and is a little awkward. However, it’s unlikely that WhatsApp will introduce easier ways of doing so therefore it’s doubtful that users will use alternative fonts or text formatting that much. On iOS: To include backticks in your messages when using an iPhone or an iPad, switch the on-screen keyboard to the numbers keypad then hold down the apostrophe until the backtick appears. On Android: All Android devices are different therefore the method is not always the same and is generally based on the type of phone. You will therefore need to find the backtick by going through all three on-screen keyboard modes (alphabet, numbers and symbols) until you find the relevant key.